THE REVIEW: Witness has a great fish-out-of-water premise, and quite the thrilling heart-pounding ending, but for most of the film you are bogged down in a painfully slow story that takes forever to get a point across. Part of the slowness is inherent to the story being told and adds a certain level of authenticity/believability to the world these characters are living in. Detective John Book (Harrison Ford) must flee to an Amish community in order to protect both the young Samuel Lapp (Lukas Haas) — the witness in a police murder — and himself, as he’s being chased by the police chief Schaeffer (Josef Sommer) who turns out to be a dirty cop. Looking in on the Amish lifestyle isn’t actually one of the slowest or more boring parts of the film; in fact it is quite fascinating. Witness as a whole just feels like it goes nowhere and you need to pull teeth for anything of substance to happen. A large part might be a result of the music, which contributes a great deal to the dull slowness of the film. It has a droning, monotonous quality to it that makes your eyelids droop and struggle to stay awake. Beneath all of this though, light does shine through for the film. An unusual relationship develops between Book and Rachel Lapp (Kelly McGillis), Samuel’s mother, which also brings with it many potential consequences. Book, being the outsider to the Amish community, struggles to fit in and Rachel’s growing love for this mysterious man brings with it consequences of its own. And then of course as I mentioned, there’s the thrilling heart-pounding moments that bookend the film: the opening murder in the train station bathroom and the final manhunt. For being such a slow film for the rest of the two hours, I was pleasantly surprised how into it I got for the final scene. In many ways it feels like an entirely different movie and makes you wonder what a few little tweaks could do to make the rest of the film that much more engaging. Witness appears to be much better received by both critics and the public than my take on it. It was nominated for eight Academy Awards (winning two), was a box office success, and has been nominated for several AFI top 100 lists. This is to say, take my opinion with a grain of salt, but I also wouldn’t be surprised if my reaction to this film is just a result of aging. 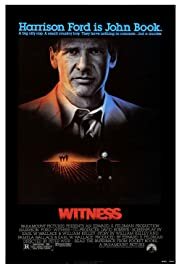 Witness came out in 1985 and a lot has changed in film since that time.